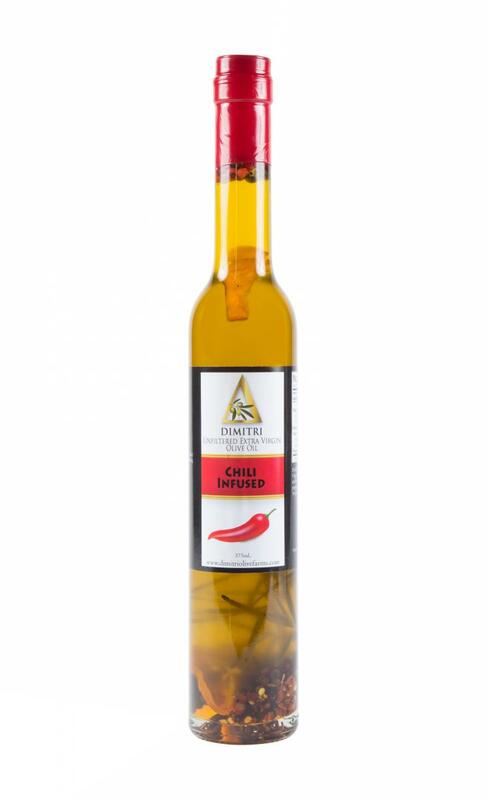 375ml bottle of Dimitri Unfiltered Extra Virgin Olive Oil infused with chili peppers. Single source olive oil is grown, harvested and pressed on a small 100-year old farm in Southern Greece and distributed by the same small company based in Baltimore. Dimitri Olive Oil is grown and produced in Greece on a small farm own and run by the Dimitri Giannakos Family. They have been farming this land for over 100 years where their grandfather planted the olive trees as a young man. The family picks, presses, bottles, and imports the olive oil. The result is pure first cold Pressed Unfiltered extra virgin. The family manages and participates in everything from the tree to the bottle. The trees are not sprayed. They lose a small percentage of production each year due to the "olive bug" but they find that a more attractive alternative than spraying.